Best results are achieved when parents and Health/Educational professionals work in partnership. The availability of services varies considerably from one area to another. What the expertise of various essential therapists are generally available they are often in short supply. 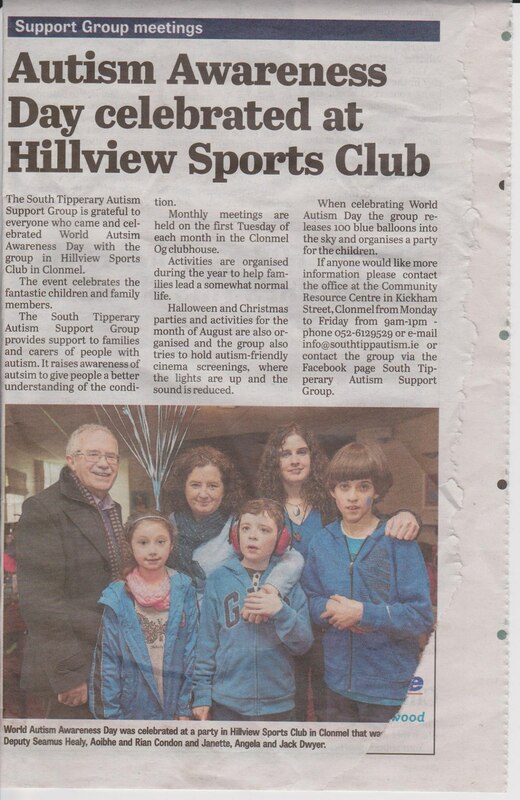 We in South Tipperary Autism Support Group will continue to campaign for necessary services to be put in place and made available to all who need intervention. Health- Diagnostic Services, support, therapies, pre-school placements, day/residential/training placements are provided by the Local Health Service Executive and the Brothers of Charity. Education- Home Tuition, pre-school special classroom in mainstream schools, special schools and classroom assistant are provided by the department of Education and Science. ASD in the Family Having a child/adult with ASD can often be very challenging, but it creates an awareness and sensitivity to the needs of other people and the rewards that their special talents can bring, as they are often gifted in music, computers, maths, and memory skills are, and cooking. There is life after a diagnosis of Autism, life can be rewarding for the child/adult with Autism, and all the people who have the privilege of knowing and working with them.